It’s been a bit dry lately, but grass is growing strongly. But now is the time you must manage it carefully, by adjusting how and when you cut. This is how to look after lawns in drought. Grass is tough, and though it may start to turn brown it will come back when the wet stuff finally arrives. When that is we don’t know. If there has been no rain by Friday 23rd this drought will be as long as the famous hot summer of 1976. While grass is growing try to change your outlook. Rather than approaching it as a “shortening, consider it to be an “evening up”, making it all level. Raise the blade height and consider leaving the clippings behind to help retain moisture and, if its clipped fine enough, actually feed the lawn too. There is always a tendency to try to cut the lawn short. Like Wimbledon, or Lords. But they have staff to fuss and care over it, t lavish water and replacements for the food it can’t create by photosynthesis. The blade of grass is the plant’s leaf, where the chlorophyll uses the sun to create its food. By removing the blade you reduce its ability to grow, in effect , weakening it. So, Rule 1. Cut your grass long. And the industry is fairly much agreed on the view that you should only ever cut 1/3rd of the leaf. But what if you have a “lawn” that has grass growing at different lengths? Then what you are doing is making it level, rather than cutting the whole thing. There are ways to improve the vigour of the rest of the grass, thereby making it grow more evenly. Rule 2 Only reduce the blade length by 1/3rd. Rule 3. Don’t collect the clippings when its hot, leave them to mulch the grass. There are views that over cutting the grass can create more problems. 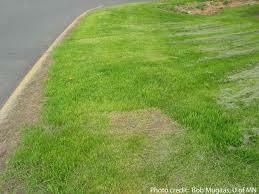 Scalping leaves soil open to weed seeds, shorter weaker grass can’t compete with them. And there may even be benefits to some invading insects. My favourite resource on lawns has to be Lawnsmith, where you get a no-nonsense view on what is right and what’s not. If you care for your lawn you’d be wise to take a look.